Welcome to Wise Owl Writing Services, a freelance writing support business owned by Madeleine O'Beirne. 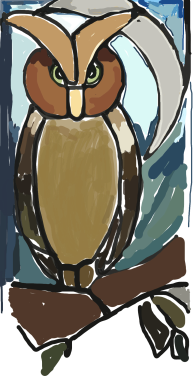 The name of the business was inspired by a stained glass window in my home, depicting the owl you see perched on a branch in my logo. When I first lived here I was struck by the apparent steadiness of its gaze, and I began to reflect upon the owl's reputation as a symbol of wisdom. This bright-eyed, nocturnal bird can move its head with ease to see in all directions, and shows quiet but impressive purpose as it swoops to catch its prey. In my work I aim to reflect something of the owl’s vigilance and dexterity, and to emulate its fabled wisdom. I hope you will enjoy looking at my website, and I look forward to sharing with you the services that Wise Owl provides.